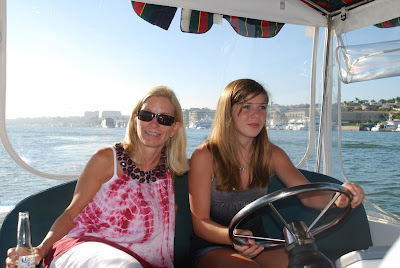 For our last night in Newport Beach I rented a Duffy and we cruised around Newport Harbor. Some old friends joined us-Carolyn who brought lots of drinks, Stacey (aka Martha Stewart west), Gary and Keith. Stacey brought all kinds of yummy, fancy looking food. Kelly drove the boat and did a great job! There were a lot of seals in the harbor-K got such a kick out of them. I just love it when she thinks something is so funny that she belly laughs. The weather was perfect and it was such a wonderful way to end our vacation. Unfortunately, I did not get many good pictures because of the light. I have tons of pictures from our trip to go through. 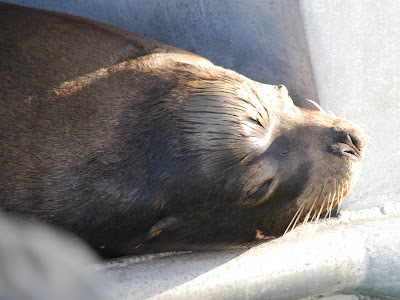 How would you like to have one of these guys living on the back of your boat? Thanks for stopping by my blog! I can relate to this post, as I am in Orange County right now for an end of summer vacation. The weather has turned a bit, and it is time to go home, but I can never get enough of the OC.